Are you ready for a flood? Are you praying for a flood? Are you anticipating a flood? A flood can be devastating, transformative, or a combination of both. Imagine waking up one Sunday morning to learn that torrential rains, road closings, and a local natural disaster in the making are potentially washing your big day away. This was the story of Mike Walker, the Senior Pastor of The Bayou Church. Now let me back up and provide some context. The Bayou Church is in Lafayette, LA. Right in the middle of oil country, which has experienced months of financial challenges. While the rest of the country has enjoyed dropping gas prices, long-standing oil communities have been enduring catastrophic loss of income. 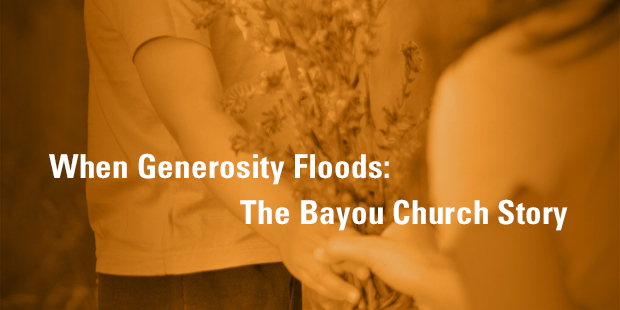 Year to date, The Bayou Church was experiencing a giving drop of 11%. Imagine losing those resources and the effect it can have immediately on your ministry. However big this loss may appear to a church leader, it could not overshadow the pain of the loss of local jobs. Individuals and families were hurting, so a strategy was put in place to focus the resources to not compromise the Mission, and also to not ignore the devastation on individuals or families. It was decided, “The Big Give” (a designated offering to five local non-profits serving the hurting in the city) would occur. A multi-month plan was put into place to reframe the church’s resources solely focused on the Mission, create a pathway for individuals to grow in generosity, and to deliver big resources to the points of need in the community. Family giving units increased by 40. Monthly contributions to the budget increased by $19,300. Contributions to the budget during and after the series averaged 12% more than the same period in 2015. Giving units during the series averaged 15% more than the same period in 2015. Contributions to the budget on May 8, 2016 totaled $114,000, the 15th highest contribution Sunday in Bayou history! That is amazing, considering an additional $170,000 was donated to The Big Give. So what were some keys to this flood of generosity? 1. You will experience a flood of generosity when you have a clearly statedMission that is more important than your circumstances. The Bayou Church’sMission is to “transform lives in Acadiana through Christ centered relationships.”This Missional Mandate is not measured in money or stopped by physical experiences. 2. You will experience a flood of generosity when you have an inspiring view from the Mountaintop. The Bayou Church has a 10-year Vision in which they will “permeate Acadiana with Christ centered relationships, making this a reality by having a point of light in every neighborhood.” It began by resourcing the community, building bridges for ministry. 3. You will experience a flood of generosity when you have clear Milestones to drive your team, holding all your resources accountable for success. The Bayou Church had determined that by the end of 2016 they would experience “500 families giving generously.” This is so specific that they will know if they succeed. 4. You will experience a flood of generosity when you deliver a path of growth helping your people Measure their steps toward the spiritual discipline of personal generosity. The Bayou Church has a Measure in their Vision Frame that states: “Do I practice generous giving?” This Measure called forth a path of five steps of growth from a Beginning Giver to an Extravagant Giver in order to live Courageous Generosity culminating in The Big Give. 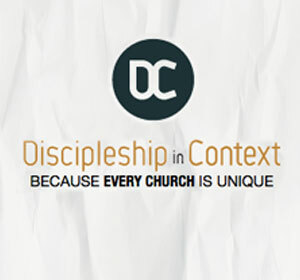 Learn more about generosity for your church. Connect with an Auxano Navigator and start a conversation with our team.